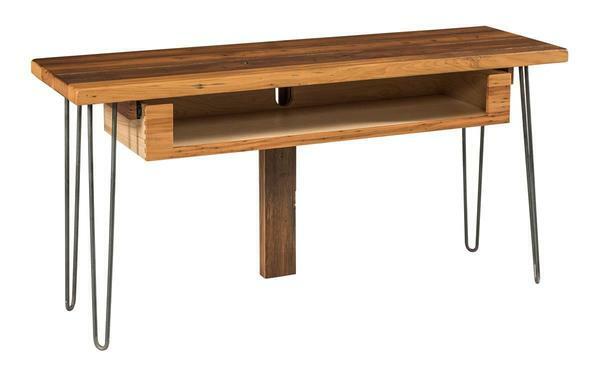 Mid Century Modern gets a rustic touch on our Amish Hyde TV Stand with a reclaimed wormy chestnut top. The unique, MCM design of this television stand with open face drawer with brown maple dovetailed drawer is a great option for a home that doesn't have a lot of media equipment and is in need of a minimalistic look with character. Supporting the reclaimed top are four natural steel hairpin legs and a wood leg in the back for cord management. Shown in reclaimed wormy chestnut with low sheen natural finish.